Asian stocks slumped to 3-year lows on Monday as a slide in Chinese equities gathered pace, hastening an exodus from riskier assets as fears of a China-led global economic slowdown churned through markets. A 2.9 percent fall in S&P 500 mini futures ESc1 to a 10-month trough during Asian trading hours suggested the falls could continue later in the global session. Against this gloomy backdrop, spreadbetters forecast a sharply lower open for Britain's FTSE .FTSE, Germany's DAX .GDAXI and France's CAC .FCHI indexes. Safe-haven government bonds and the yen rallied on the widespread unrest in financial markets, set in motion when China sharply devalued its yuan and stoked fears about the state of its economy. "Markets are panicking. Things are starting look like the Asian financial crisis in the late 1990s. Speculators are selling assets that seem the most vulnerable," said Takako Masai, the head of research at Shinsei Bank in Tokyo. Stock exchanges from Japan to Indonesia were hit hard as Chinese shares slid from the open on Monday after Beijing offered no big policy move at the weekend to support equities, as was widely expected after last week's 11 percent plunge. "The market is in a downtrend. There's no good news, stocks are still expensive, and there's no fresh money coming in," said Qi Yifeng, analyst at consultancy CEBM. "With no RRR (reserve requirement) cut over the weekend, the market will directly head south." MSCI's broadest index of Asia-Pacific shares outside Japan .MIAPJ0000PUS duly sank 5.1 percent to a three-year low. 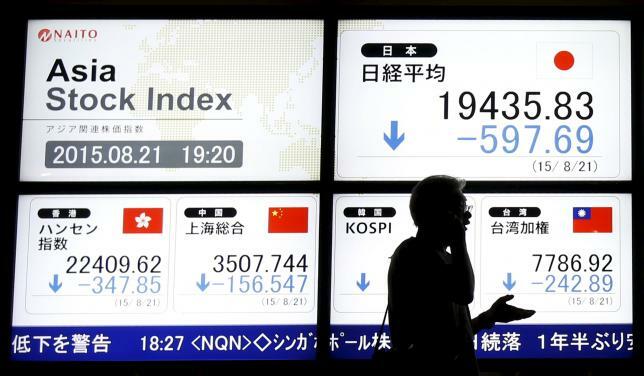 Tokyo's Nikkei .N225 was down 4.1 percent and Australian shares retreated to a two-year trough. A Caixin/Markit PMI survey on Friday showed Chinese manufacturing activity shrank at the fastest pace since 2009. Even before the Chinese markets opened, stocks in Asia took a beating after fears of a China-led global economic slowdown drove Wall Street, previously seen as a safe-haven, to its steepest one-day drop in nearly four years on Friday. The cost to insure China’s five-year government debt CNGV5YUSAC=MG with credit default swaps (CDS) rose on Monday to around 117 basis points, or $117,000 per year for five years to insure $10 million in debt, from around 100 basis points last week, according to Markit data. South Africa's rand ZAR=D3 briefly touched a new all-time low of 14.0000 against the dollar. The Malaysian ringgit hit a 17-year low MYR=MY. The dollar was down 0.8 percent at 120.98 yen JPY= after hitting a six-week low of 120.73. The euro soared to a 6-1/2 month high of $1.1499. U.S. Treasury yields extended their decline on safety buying alongside the slide in equities. The benchmark 10-year Treasury note yield US10YT=RR touched a four-month low below 2 percent. U.S. crude was down 2.8 percent at $39.33 a barrel CLc1 while Brent LCOc1 lost 2.4 percent to $44.35 a barrel. Copper, seen as a barometer of global industrial demand, tumbled with three-month copper on the London Metal Exchange CMCU3 hitting a six-year low of $4,920 a tonne. Aluminum CMAL3 also slid to its lowest since 2009 of $1,526 a tonne.